Ronchi Di Cialla, meaning “hills of Cialla”, is located in a small valley surrounded by chestnut, oak and wild cherry woods in the DOC Friuli Colli Orientali. The sunny slopes of the small Cialla valley have been planted with vineyards for centuries. History and tradition suggest that Verduzzo, Picolit, Ribolla Gialla, Refosco dal Peduncolo Rosso and Schioppettino were the most appreciated and popular vines. Schioppettino, in particular, is a variety, which is limited to an area spreading over a few kilometres of land between Cialla and Prepotto. This particular species, which had been about to disappear, was saved at the beginning of the 70s thanks to a bold and resolute decision made by Ronchi di Cialla. In 1970, the wines of this region were brought back to life by Paolo and Dina Rapuzzi when they bought a property in Cialla for the purpose of growing only local grapes. At that time, the only traces of Schiopettino were in ancient manuscripts and in the memory of the elders. Paolo and Dina Rapuzzi managed to find about 70 surviving vines in the valley and nearby, which enabled them to create a whole new vineyard and resuscitate Schioppettino. From the very first test of the new wines, it was evident that Schioppettino would age perfectly and could match the best international grapes with its elegance, complexity and finesse. Today, continuity is ensured by their sons, Pierpaolo and Ivan. This is a family business, keen on growing vines with ancient local origins which are well suited to the Eocene marl soil. In 1976, Paolo and Dina won the esteemed Risit D’Aur award for their work in preserving the Schioppettino variety, which they are credited with bringing back from the brink of extinction. 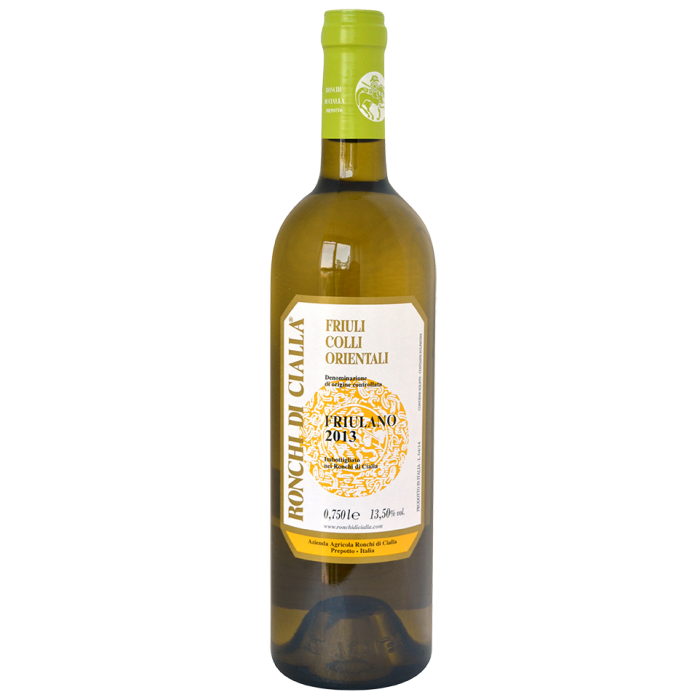 Ronchi Di Cialla is certified as biodiversity friendly by the World Biodiversity Association, and they remain committed to using natural practices with minimal interference when possible, having been one of the first winemakers to adopt integrated agriculture with low environmental impact. Pruning is carried out with the utmost care and fungicide treatments are tightly controlled. Working with relatively low yields of 115,000 bottles per year as dictated by the Cialla Cru, wine making is carried out using natural methods with as little interference as possible.